This fine carved wooden headrest from the Shona people has an exceptionally fine, deep, lustrous patina. The patina on such genuine, old headrests comes from the hair oil used by Shona tribes-people (usually the men) which builds up over many decades of use by the one owner. The base is of double-circle form from which rises two concave columns which support a concave headrest. The columns are chip-carved with differing geometric patterns. The head platform itself is curved and rounded and has a decorative downwards hanging ‘wing’ at each end. The ends and these ‘wings’ themselves are chip-carved. 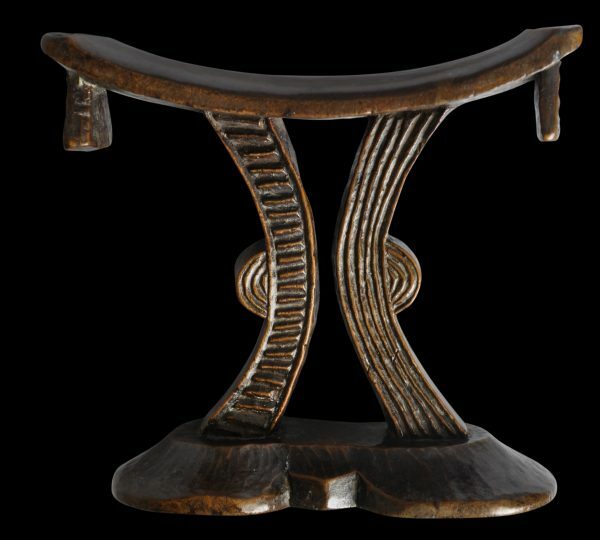 The carved patterns are meant to symbolise the facial scarification (nyora) of Shona womenfolk notwithstanding the exclusive use of such headrests by men. The headrests usually were taken by their owners when travelling and often were buried with the owner when he died. 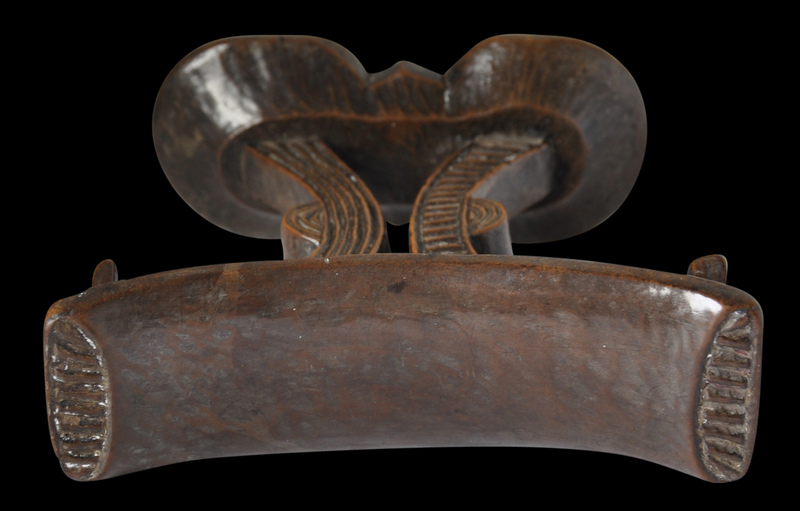 They were deeply personal objects and were used to help support the elaborate coiffures that were fashionable among Shona men up until the end of the nineteenth century. Related examples are illustrated in Petridis (2011, p. 28), Herreman (2000, p. 29) and Ginzberg (2000, p. 42). The example here is in excellent condition. There are several old chips and dents to the extremities but these have a fine patina of their own. Ginzberg, M., African Forms, Skira, 2000. Herreman, F., In the Presence of Spirits: African Art from the National Museum of Ethnology, Lisbon, Museum for African Art, New York/Snoek-Ducaju & Zoon, Gent, 2000. Petridis, C., The Art of Daily Life: Portable Objects from Southeast Africa, 5 Continents, 2011.